The D-Opto shutter system was deployed for 7 months on a telemetry buoy in the Étang de Berre, Marseille, France. 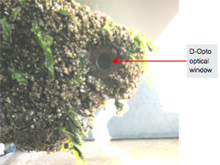 Despite very heavy barnacle growth, the optical window remained clean and the D-Opto was still taking accurate measurements. The D-Opto Shutter system has a self-monitoring on-board intelligence that ensures reliable operation of the sensor by covering the the optical window between sampling – opening only when a sample is taken. Controlled by the same data logger attached to the D-Opto. The D-Opto Shutter is a mechanical shutter system designed attach to the side of the Zebra-Tech D-Opto optical dissolved oxygen probe. Between measurements the Shutter disc covers the sensor window to reduce the incidence of bio-fouling and deposits settling and developing. The Shutter itself incorporates a copper stud, which further discourages the growth of bio-fouling due to the toxic nature of copper. When a measurement is required, the Shutter disc is rotated away from the sensor window, allowing a representative sample of water to come into contact with the D-Opto sensor window. After the measurement has been made, the Shutter closes over the sensor window. The D-Opto Shutter can be simply controlled by the same data logger that records the output signal from the D-Opto, provided it has a spare programmable control port. If the data logger control port is set low, the Shutter closes; when the control port is set high, the shutter opens. The Shutter features a supervisory microprocessor, which constantly monitors the position of the shutter arm, protecting both the D-Opto and the Shutter in the event that debris becomes trapped between the D-Opto and the Shutter. The Shutter has been designed to operate with minimal power consumption, making it ideal for long term remote deployments with a finite battery supply.